Firstly I have an announcement to make. 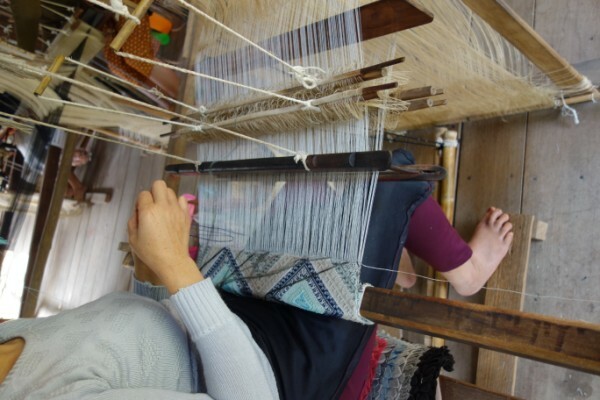 Because of the mothballing of weaving at Sturt and the reduction and in some cases the elimination of weaving in educational institutions, I have become increasingly concerned about the future of learning to weave. I have decided to do something about it and set up a school in my studio. I have a quantity of looms that are great to work on and are of different types. To launch the school, I am offering a week long workshop from Monday 6th to Friday 10th of July. I will be posting details of this launch on both my blog (see heading above) and on my web site. 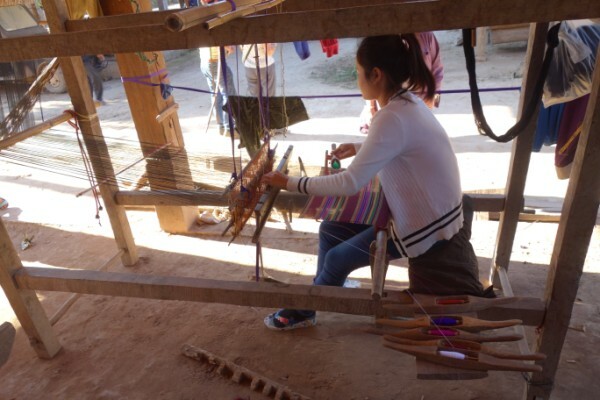 Following the launch, there will be a variety of learning opportunities which I hope will suit the needs of individuals in the weaving community. I hope to see some of you here in the future sometime. 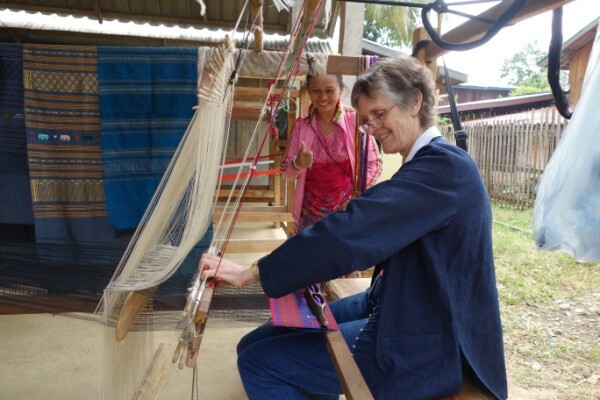 As promised last month, the focus of this month’s blog is looms and weaving from my trip to Laos and Nth Thailand. There was a similarity between them whether they had a vertical or horizontal storage system or just wove plain weave. The framework looked the same. I must admit that I was in some ways surprised at how little variation there was. In reality one could just remove one storage system and drop in the other and it would be ready to weave. The way the warp was handled also was similar throughout. A basic loom that I measured (and I only measured one)had a height of 160cm, width of 99cm and depth of 220cm. The only minimal variation was in the width as that could govern the width to be woven eg a skirt or a scarf. 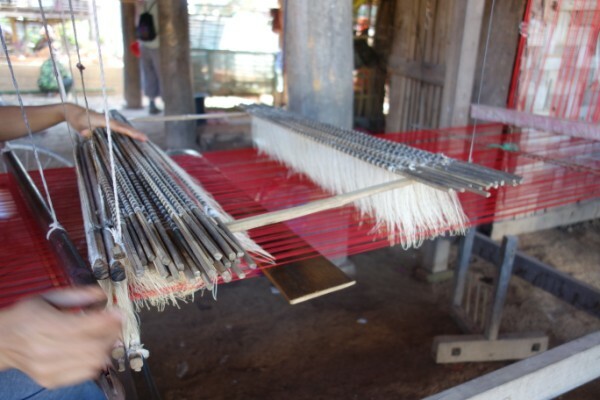 The above image is of a two shaft loom with no pattern storage. It is not the one I measured though gives a point of reference to the following. Let’s start with the warp threads. They were always in a bag either hanging from the top beam (note the warp wraps around the beam when it comes out of the bag) or placed in a bag on the ground at the front. A bag on the ground held heavier warps. The warp when I looked in the bag looked as though it was taken from where it was wound and then just coiled in the bag. I do not know if anyone was doing a variation such as chaining that western weavers might do. I did not see any warps being wound but was told at several places that they were prepared under the house using the house stumps to measure out the length. There was no evidence of the warp being tied before it was placed in the bag. No one was undoing ties as they advanced a warp. The warps were all very long. In one case I was told that the warp was 100metres, in another 72meters. 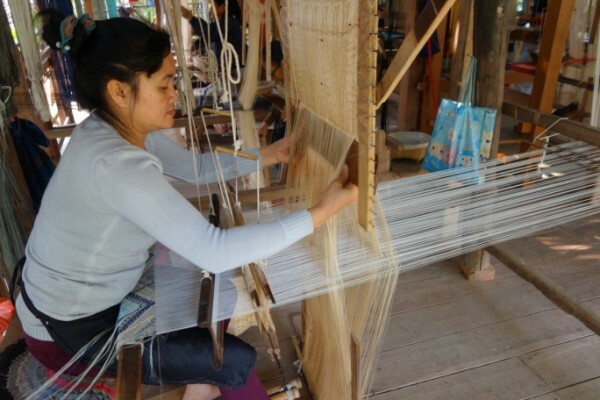 It is not surprising that very long warps are used because of the effort required in setting up a loom. 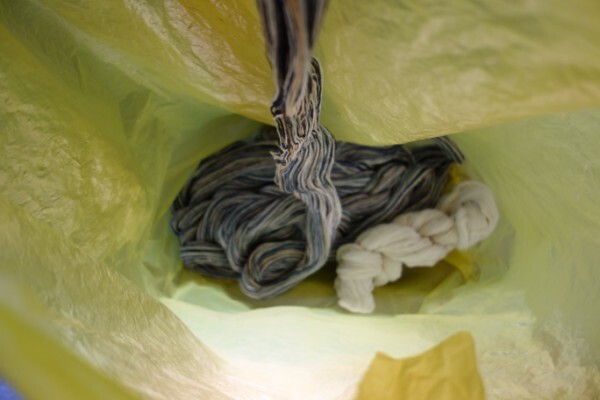 I was surprised that the warps were just coiled in the bag and that there appeared to be no problems with them becoming a mess. This warp was very heavy and was sitting in an open bag on the ground rather than hanging from the loom. 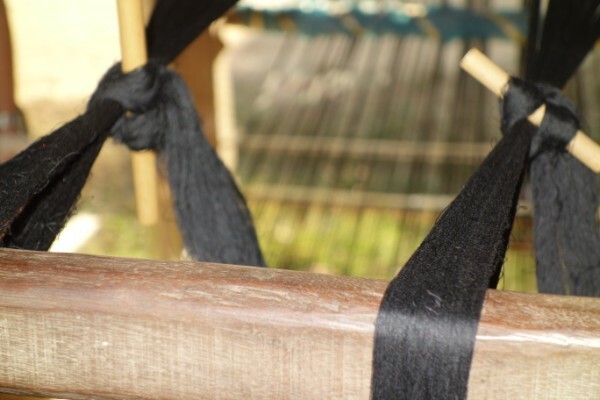 The warp was knotted with a stick inserted in the knot on a front beam above the weaver’s head. This was then end where the tension of the warp was adjusted. 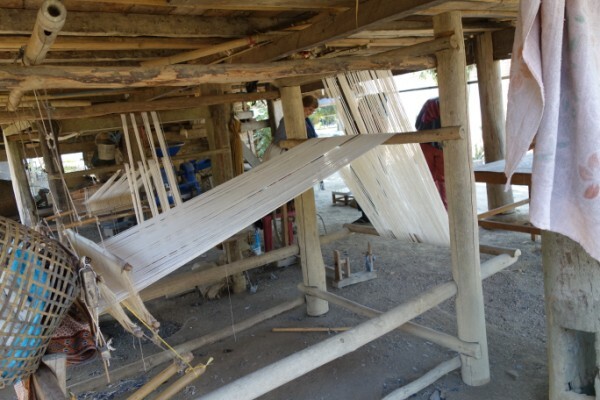 The weaver would wind on the woven cloth and then tighten the warp here. 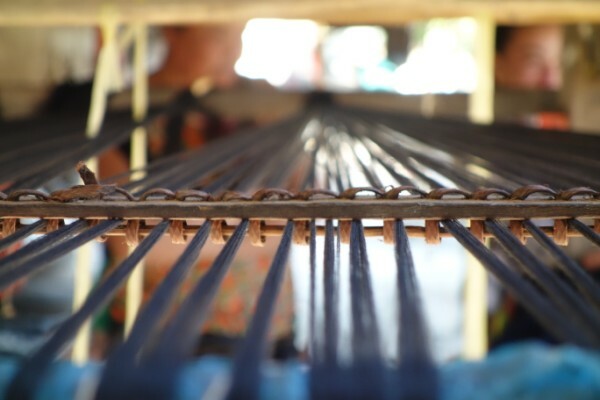 The warp threads passed over the top of the loom down the back of the loom to the front. I’ll ignore the pattern storage methods for the moment. At the front the cloth was wound directly onto the beam at the front of the loom. This beam also served as a means of controlling the tension at this end. There was some variation in how this was done. The most common was a squared end of a beam with slots so that the warp could be advanced a quarter turn. Only one end of the stick had a slot for tensioning. PVC pipe used in a similar way. 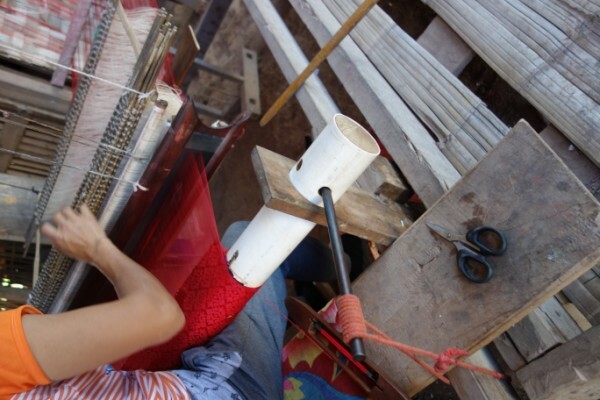 A metal length tied to the loom bench replaces the upright spike on the other method. Sometimes the ends of the cloth beam were carved. Before the first weft was woven, the warp was secured by a stick placed in a grooved slot along the length of the front beam. When the warp was wound on, the cloth sat evenly around the beam. I did not notice any knots. 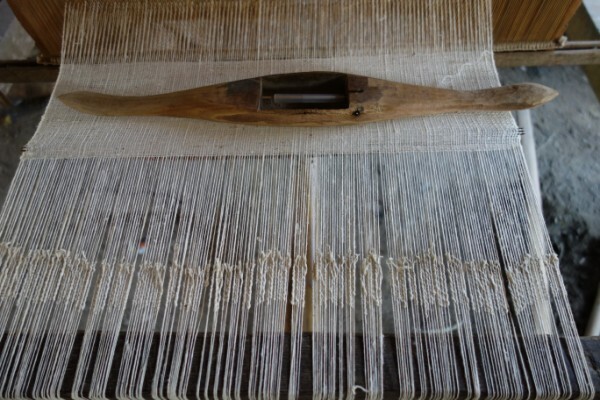 As far as I could work out the warp was placed on the beam, the stick (white in the case above) put on top and the warp threads pushed into the groove, enabling tension to be achieved as the warp was wound on top of the previous layer. 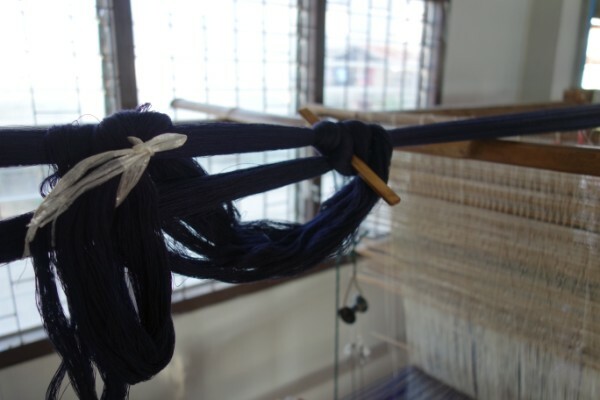 To get the warp ready for weaving, the warp was pulled out of the bag, knotted on to a previous warp and pulled through. I saw no evidence of someone threading a loom thread by thread. The beater was suspended from the frame with 2 pieces of cord as was the 2 shafts used for plain weave. The beater was not attached in any one position. It could be slid backwards as the weaving progressed. Then when the weaver could no longer reach the knot above the weavers head was released, the cloth rolled on and the knot remade and the warp tightened. In the image above the shafts swivell in a counterbalance action when the cord slides through a bamboo tube. In the image below, there is a pulley. This weaver even stood so that she could reach further. The reed (method of spacing the threads in the beater) was either bamboo or stainless steel. I saw more bamboo reeds. The stainless steel ones were considerably more expensive to buy. The frame was the same for both. The treadles for plain weave rows were two lengths of bamboo, tied to the bottom of the plain weave shafts. 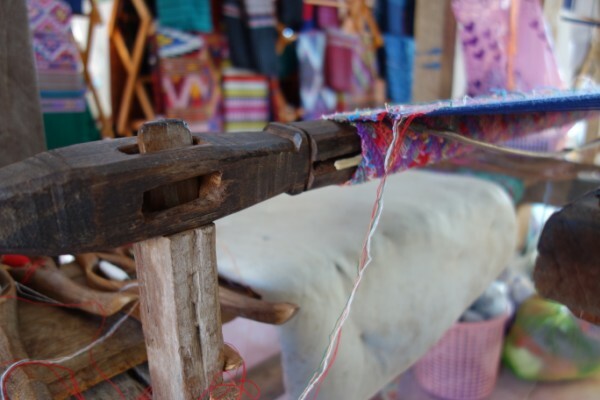 They were not attached to the frame of the loom, but rather just positioned on the ground so the weaver could use a very efficient toe/ heal action with one foot on the two treadles. Notice in the image above the previous one, the rest for the weaver’s feet beside the treadles. 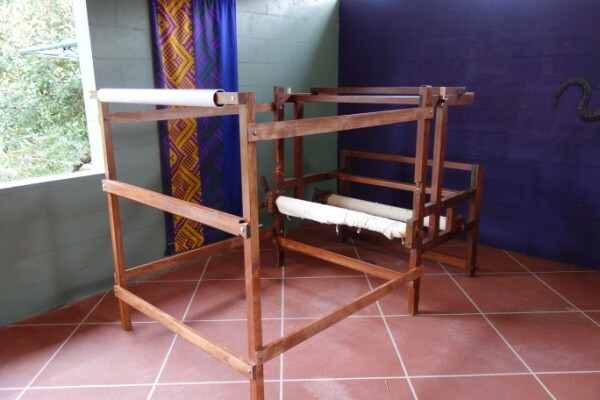 The weaver’s bench was attached to the two front uprights and fixed. They got in and out of the loom very easily. I had to fold myself up when I got in, to the great hilarity of those watching. There wasn’t much room under there to move my legs to weave. Note the shuttle I’m using has two bobbins. The pattern shafts sit behind the two plain weave shafts. The pattern shafts rest on a suspended frame. 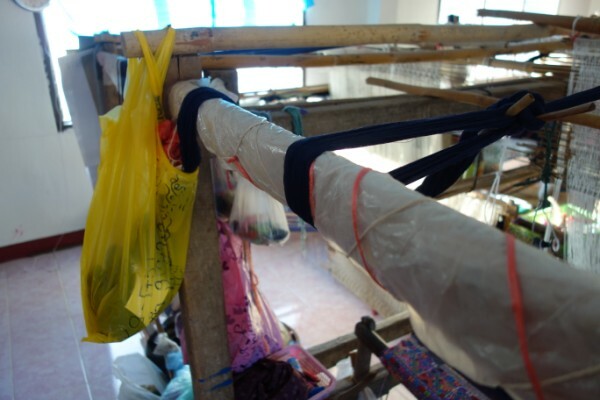 We saw a lot of bundles consisting of beater, and a number of sticks with heddles on them with a short warp threaded through hanging on walls near the looms. Obviously each bundle was for a particular pattern. It was also possible to buy bundles in a market. As I have mentioned the warp threads were knotted onto the threads in the bundles enabling the pattern shafts with their stored pattern sequence, plain weave shafts and beater to be set up in one go. The shafts for plain weave had a bar top and bottom. 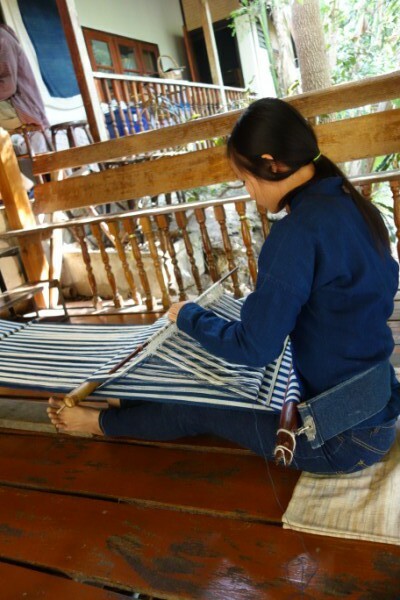 It needs to be tied above and below the loom to enable the alternate plain weave rows to be raised or lowered. The pattern heddles had only a stick at the top. I did not see any weaver setting up their own patterns. No doubt a skilled weaver would be able to do so. This is the weave sequence that I used when I got to sit in one of these looms and weave. Raise the pattern shaft required. Insert the sword. Lay it flat behind the plain weave shafts. Weave the first plain weave row. Stand the sword on its edge and weave the pattern row. The pattern row may be repeated twice, with alternate plain weave rows between. The number of pattern sticks denotes how complex a pattern is. The pattern sticks are moved forward or backward in sequence. Sometimes only a part of the sequence may be used so the full repeat need not be used from the first to last stick. The next pattern stick to be used was adjacent to the one being used. This pattern requires 40 pattern sticks. Vertical storage system using sticks. The weave pattern can be clearly seen. Instead of sticks the pattern is held by a looped string which can be hooked over the nails in the side of the frame. This allows an even longer pattern repeat to be stored as it takes up less space than the sticks. The system works the same as when sticks are used. Each warp thread passes through the ‘eye’ of a heddle on the vertical storage system and through one on the plain weave shafts (alternating). 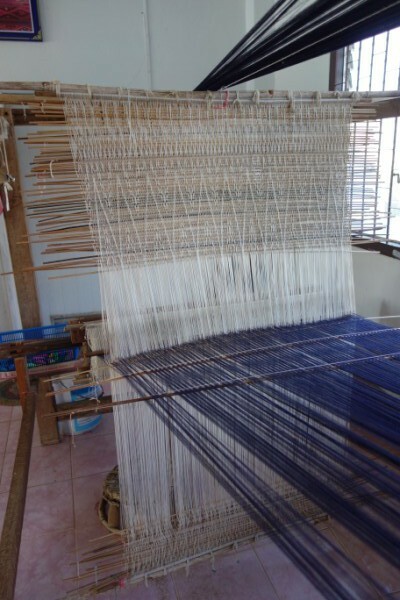 The warp is set up on the loom and tensioned before creating the stored pattern sequence. 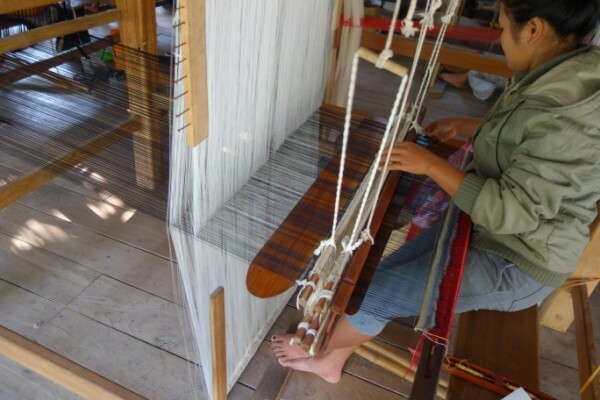 The very long heddles are anchored near the floor and at the top of the loom frame. 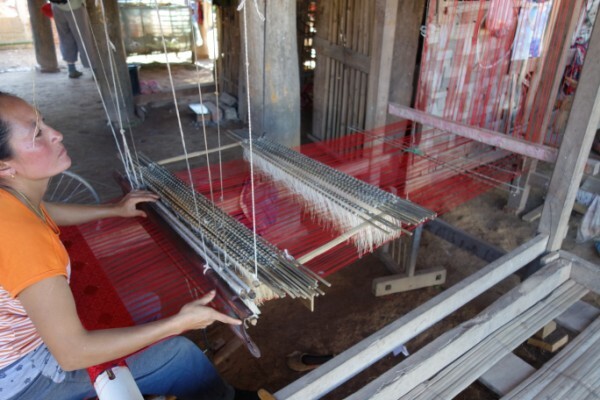 To set up the pattern sequence, a pick up stick is used to select the pattern threads. These are then transferred to the back of the loom using a sword. And then the threads on the sword are transfered to the pattern storage system by a stick which is then replaced by in this case a looped thread. The same sequence as before is used: weave plain weave, pattern (pick up) etc. 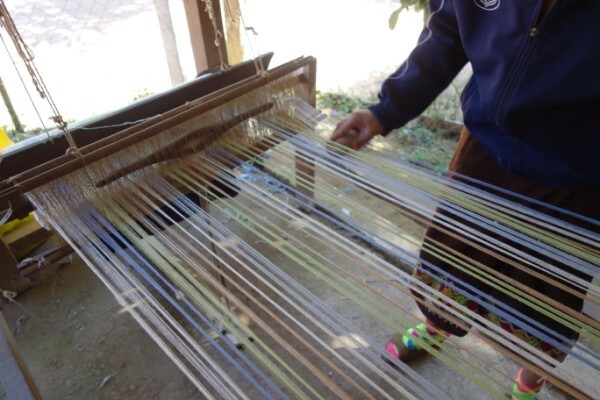 The stored pattern the sequence moves from below to above the warp threads and back again. The pattern heddles are pulled forward so that the sword can efficiently select the stored pattern. The looms with vertical storage were more prevalent than horizontal ones. On two looms there was a means of spacing the warp evenly across the width. 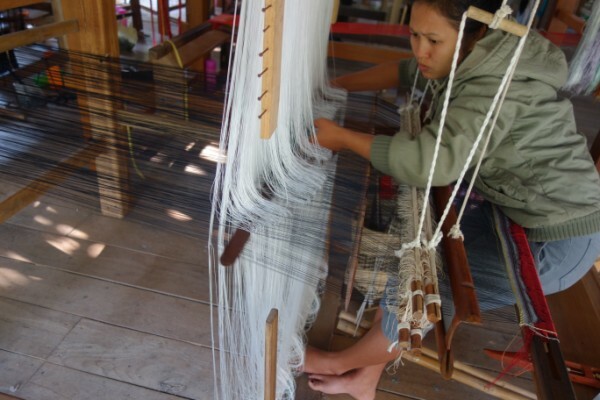 All other looms had no means of doing so. Note the padding on the top beam to stop rubbing of the warp threads. A bamboo storage holder for multiple shuttles. I’d also seen this in Northern Vietnam. Shuttles that could hold two or three bobbins so that a thread may be woven doubled. 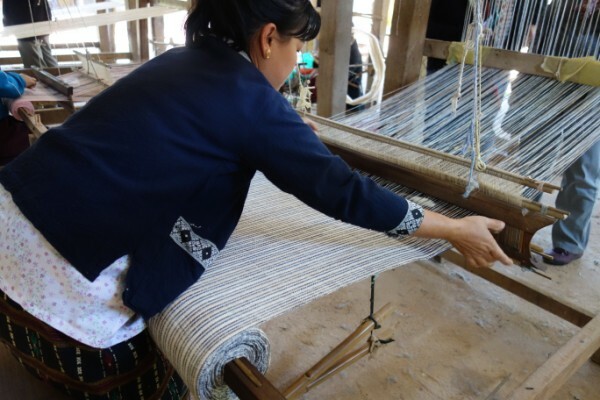 In one weaving space where they were weaving hand spun cotton, the warp thread was sized in rice water to prevent the cotton from fraying and breaking. One lady here was doing an interesting thing. 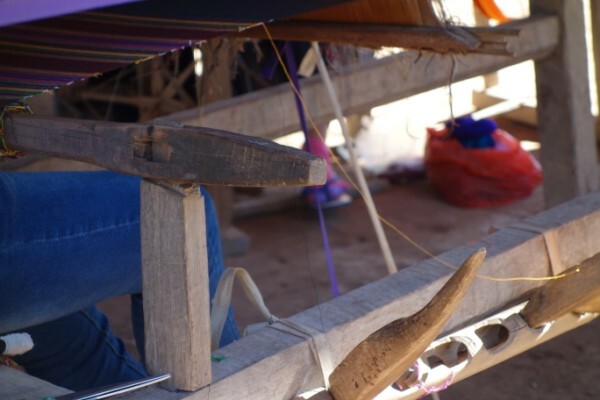 After she had advanced the warp, she brushed it with a stiff bristled brush to separate the warp threads. Maybe she was having trouble with warp threads sticking together. No one else was doing this so may be this was just a problem warp. 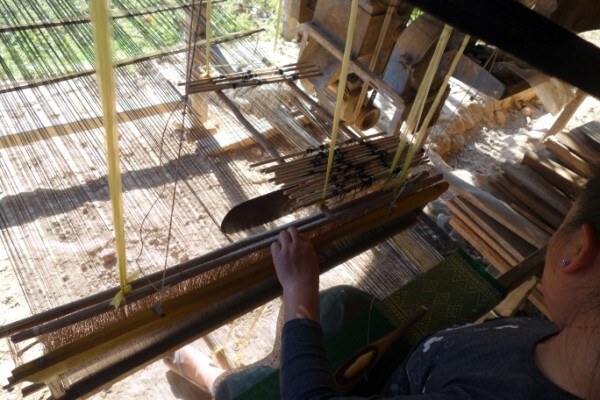 But then she ran a piece of bee’s wax over a weaving sword and smoothed it back over the warp threads: in essence putting back on a type of sizing. 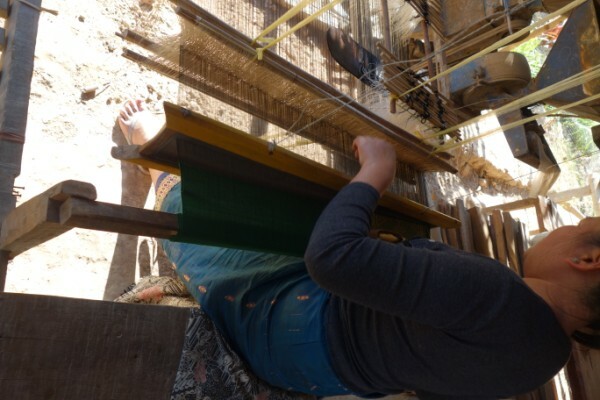 There was an interesting variation with a loom where a lengthways border was being woven with a vertical storage system. Only part of the width of the warp required pattern shafts. These were suspended above where they were required. On the same loom as the one previous, 2 knots were being used to tension the warp. This was a very wide warp as the width being woven was the length of the skirt. The border ran around the hem. This was one of the two looms using a spacer for the warp at the back of the loom. The two knots would have made tensioning the warp across the full width more consistent. I did not note whether the pattern section was grouped in one knotted warp. If this were the case, it would allow for any variation in take up of the pattern verse plain weave only as they were being woven. 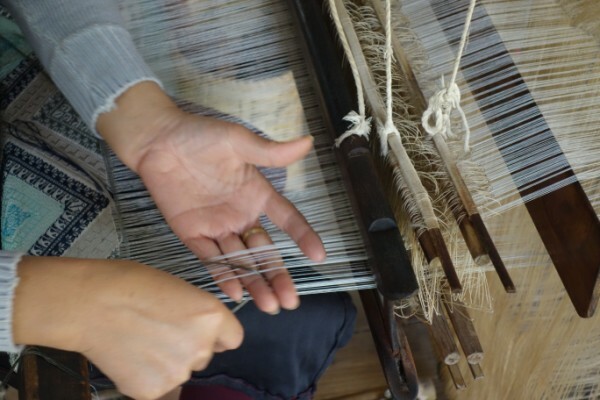 Discontinuous weft threads are inserted in the pattern row. The pattern row may be selected by either the horizontal or vertical storage systems. This was an interesting variation on the basic loom. Note that the warp runs at an angle to the ground and is extended at the back. 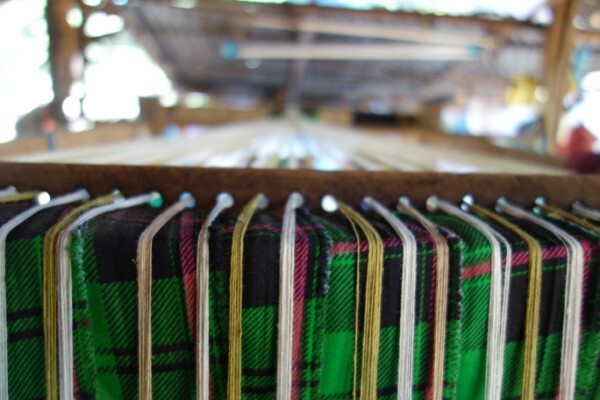 The warp is still knotted at the front of the loom with the warp in a suspended bag. 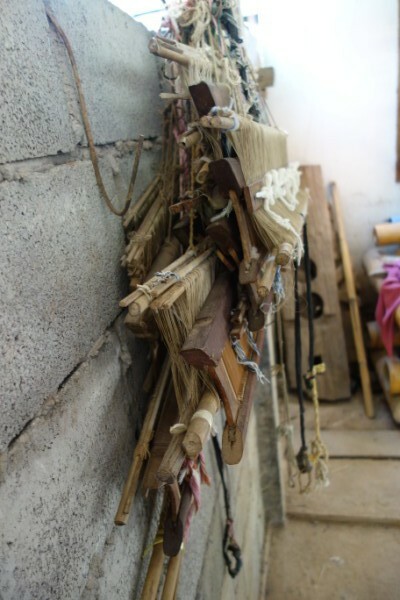 A suspended bundle of beater and shafts with the remnant of the last warp knotted in place enabling the next warp to be knotted on and then pulled through. 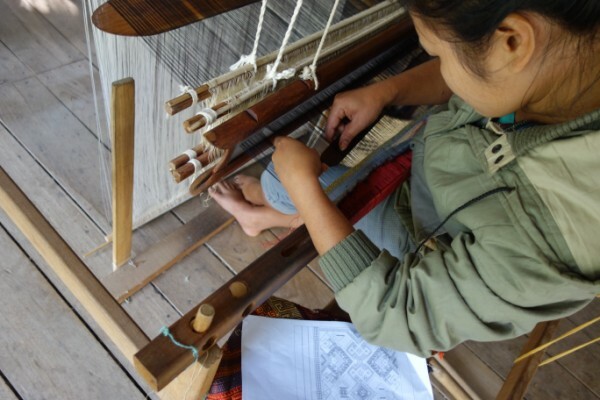 It is worthwhile to note that we only saw one weaver using a back strap loom on this trip. 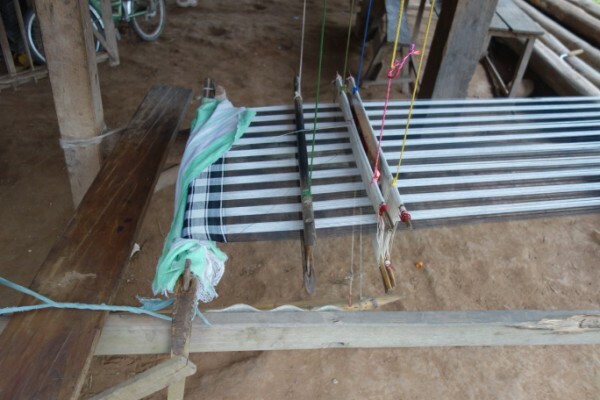 It was used for demonstarting weaving at Patricia Cheeseman’s studio and rolled up after the demonstration was complete. 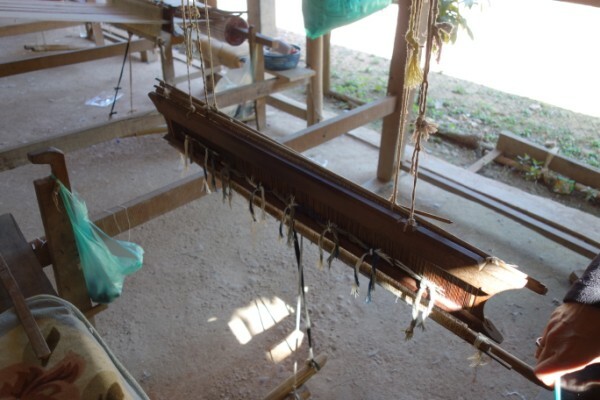 Based on what we saw on the rest of the trip, one would suggest that it was used for convenience sake, and perhaps not a typical loom used by her weavers. 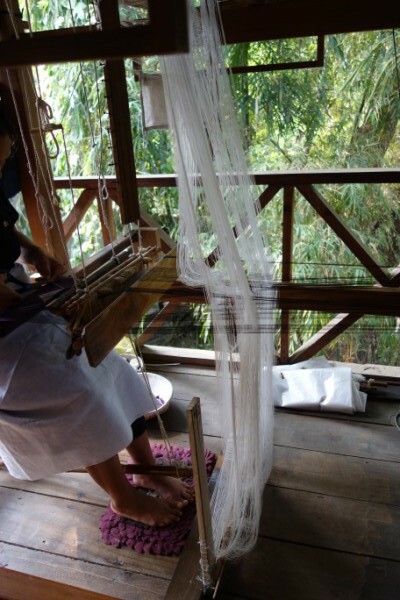 Inspired by the looms of Laos, I’ve decided to have a bit of a play. There’ll be more about what is happening here next month, but here’s a bit of a taste of things to come. You are currently browsing the Kay Faulkner's Blog blog archives for April, 2015.